Proper alignment should be a consistent part of your pre-shot routine. Golfers struggling to record low numbers on the course often look for a swing fix, but for some novices, the problem may lie in their alignment before beginning the shot. Finding the proper alignment can have as much impact as anything that happens during the swing. Before hitting the course, work on the range to find the proper alignment of feet, shoulders and grip for each kind of shot you may encounter during a round. On the driving range, address the ball as though you are going to hit a shot. Your feet should generally be about shoulder-width apart. Once in position, place a golf club at your feet across your toes. Then walk behind the ball to see if your feet were aligned parallel to the target line. If not, realign your feet and check again. This can also be done with the shoulders by holding a golf club to your chest to see where the shoulders are aligned. You may be surprised to see the difference between where you are actually lined up and where you thought you were lined up. Ball position is where your body is lined up in reference to the golf ball. For the driver, the ball should be positioned off the inside heel of the front foot. For longer irons, the ball should be a few inches farther back in the stance. For shorter irons and wedges, the ball should be about halfway between your feet. Ball position is important because it often determines the trajectory of the shot. You should take their normal, relaxed grip when aligning for a shot. The perfect grip will vary for many golfers, but grip pressure is important. The club should be gripped at a firmness of about 6 on a scale from 1 to 10. This will allow the club to easily turn over in your and promote a relaxed swing. One of the best ways to ensure a proper alignment on each shot is to develop a pre-shot routine, which allows you to go through a mental checklist of swing thoughts, take a deep breath and hit the shot. A basic routine is to stand behind the ball for a moment, walk up to the ball, get aligned and then hit the shot. 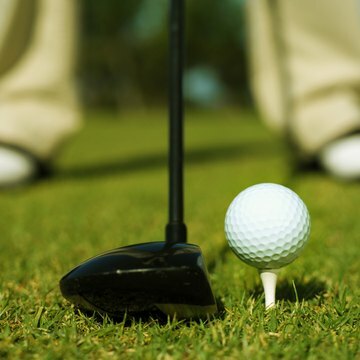 Developing the routine can also help you visualize a well-hit shot before making your swing. If the alignment isn’t done properly, it can sometimes introduce the possibility of a slice or hook. If shoulders are aligned to the left of the target (for right-handers) a slice will result, with the opposite resulting in a hook. Make sure the shoulders and feet are aligned parallel to the target line. How Do I Avoid a Golf Slice?